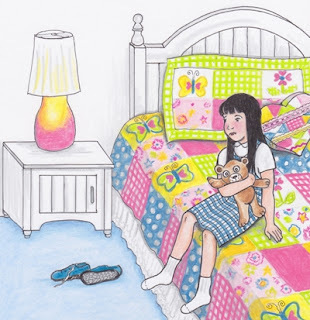 Molly McBride and the Purple Habit, by Jean Schoonover-Egolf is the first in a series of charming books about a five-year-old girl, named Molly McBride. 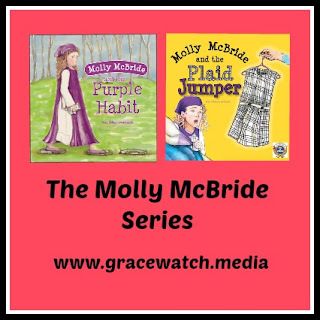 Molly loves imitating the Children of Mary Sisters, by wearing their purple habit, specially crafted, for her, by her mom. She loves it so much, that she wants to wear it to her big sister’s First Communion! Why can’t she, when the Children of Mary Sisters will be there, and they will be wearing their purple habits. Oh, can you imagine the havoc that would ensue in dealing with that on such a busy morning? You’ll need to read the story to see whether Molly gets her way. 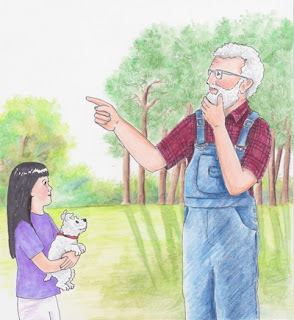 Love Letters from God, Bible Stories for a Girl’s Heart, by Glenys Nellist is endearing, wonderful, chocked filled with virtue, and beautifully illustrated. Nellist shares with us fourteen stories from the Bible, centered on heroic females, highlighting their good traits. 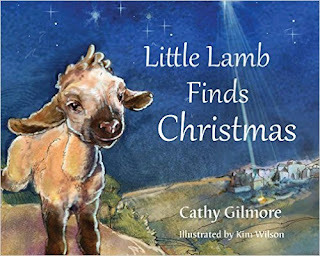 She takes us from the Old Testament, through to the New Testament; giving us a different story about each protagonist, salient Bible quotes, and most importantly, personalized letters from God, addressed to your child (with lift the flap notes). Love Letters from God Make for Sweet Dreams! 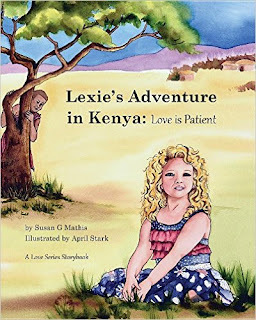 Let me introduce you to Lexie Goodwin from Lexie’s Adventure in Kenya – Love is Patient, written by Susan G. Mathis, and illustrated by April Stark. Love is Patient is the first installment in a series of children’s books that Mathis and Stark plan to produce based upon 1 Corinthians 13. This intended series uses a very interesting approach in teaching children, not only about the facets of love, but also about interacting with others, as well as about living in another part of the world. Lexie’s parents visit missionaries and assist them in their efforts. They bring their children, Lexie and Cori along for the adventure. With excitement, I share some great news with all of you! Please celebrate with me! 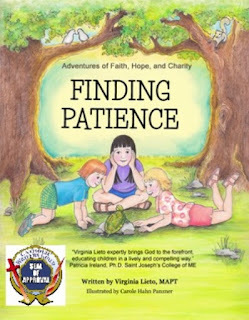 Adventures of Faith, Hope, and Charity – Finding Patience, received the Catholic Writers Guild Seal of Approval. The Guild awards this honor to literature that embodies and reinforces teachings of the Catholic Church. The Guild’s Seal of Approval provides retailers, and the public, with assurance that what they purchase contains quality. Seal of Approval books are known for their Catholicity and editorial quality. Each submission goes through much scrutiny. The Guild prides itself in only recommending those books that positively add to the spiritual life of the reader, in accordance with Catholic teaching. Therefore, I am humbled and honored that Adventures of Faith, Hope, and Charity: Finding Patience now counts among what the Guild considers quality, Catholic literature. In Adventures of Faith, Hope, and Charity: Finding Patience, Mr. Luke Gabriel lives next door to his new neighbors, the Livingstone family. He is retired from corporate life, and a widower. To fill his spare time these days, he breeds Westminster Terriers. Why, you might ask? Because the loss of his dear wife left such a hole, that he attempts to fill that hole with the unconditional love from puppies. He has developed quite a passion for these dogs, and they are fun to have around an empty house. Hope Livingstone, and her family, had just moved into a new house, in a new town. Life was chaotic. Boxes were everywhere. Peanuts were flying out of boxes, thanks to Hope’s little sister Charity. Hope didn’t mind that it would mean that Hope would need to clean it all up. Hope thought moving was exciting! 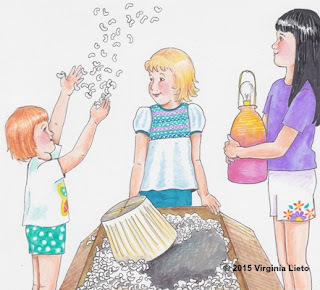 Everywhere she turned, she found a new surprise, as she explored every nook and cranny of their new house! 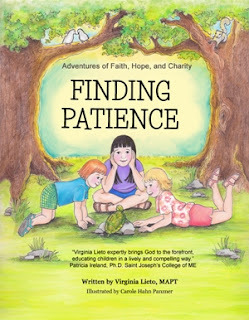 Adventures of Faith, Hope, and Charity: Finding Patience (The Back Story) Faith was anxious about moving to a new town. That meant a new house, new school, and new friends. Faith was shy and found it difficult to make new friends. She dreaded the move and all of the change that would ensue. Faith had very little patience. She wanted to claim her “new normal,” ASAP, for she knew that once things settled down, she would feel more comfortable about this move. Faith did not welcome change! Charity Livingstone is only three years old, but she is spunky, loyal, and determined to get what she wants. She and her family recently moved into the neighborhood, where they met their next door neighbor, Mr. Gabriel. Charity really liked him, because he raises puppies! Adventure it was for Faith, Hope and Charity Livingstone (my three main characters in my new book) as the girls made their debut visit at a book signing this past weekend. My husband and I had a blast meeting people from all walks of life at St. Thomas Aquinas Catholic Church’s World Feast. The weather wasn’t very cooperative, (lots of rain) and thusly, attendance was down, but that didn’t stop the festivities. There was great food, games and entertainment for one and all – a true family entertainment experience. We had an open house for our new parish office building too! Lots going on. Since my children's school only assigned a grand total of eighteen books for my six kids to read over the summer, I decided to add a few more unassigned kids' books to my reading list this summer. Hah! If your local school is like ours and your kids need to read 25 books each just to complete the school year requirements, either of these two choices would be great picks. 1. 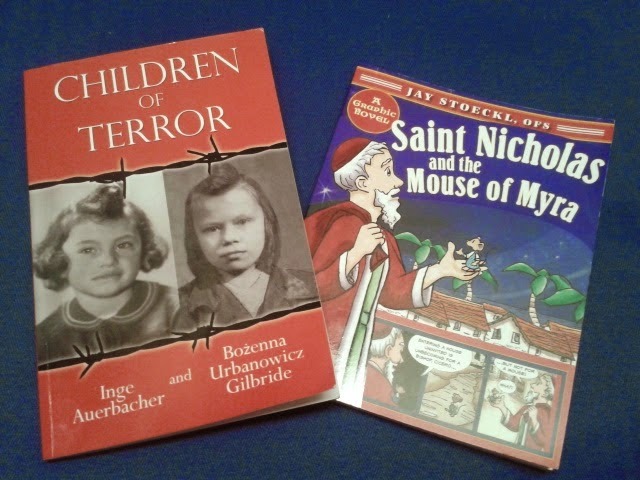 Saint Nicholas and the Mouse of Myra, by Jay Stoeckl. 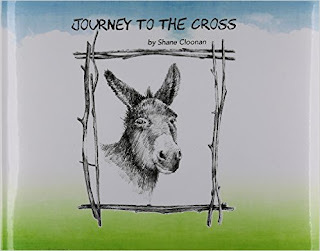 This graphic novel is the sequel to Saint Francis and Brother Duck, which I reviewed last year. I enjoyed Stoeckl's second book even more than his first, perhaps because our family loves St. Nick so much. "Don't forget the poor," whispered Cardinal Gomez of Brazil to Cardinal Bergoglio of Argentina at the moment of Bergoglio's election to the papacy. These words inspired the new pope to take the name Francis in honor of the saint who loved Lady Poverty. As St. Francis of Assissi's feast day approaches on October 4, now would be a wonderful time to introduce your children to the two Francises through some great new releases from Paraclete Press. 1. St. Francis and Brother Duck, by Jay Stoeckl, is a charming presentation of the story of St. Francis of Assissi in a graphic novel format. Francis' constant companion is the fictional Brother Duck. Maria Stewart is a homeschooling mother of seven. She is a graduate of Franciscan University in Steubenville where she majored in Elementary Education and Theology. Maria and Chris, her husband, are involved in the Casting Nets Ministry (www.CastingNetsOnline.com). They are also involved in foster care. 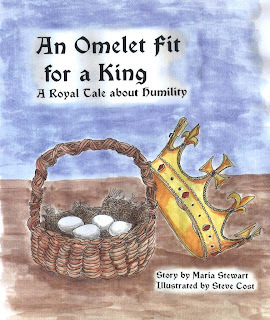 One has to wonder how this busy woman ever found time to write her wonderful new children’s story An Omelet Fit for a King—and yet when God asked her to write it, how could she not? 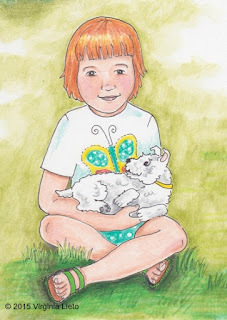 In the charmingly illustrated book, Maria explores different aspects of humility using the acronym E.G.G.S. A lesson she admits she learned herself while being hospitalized and relying on the love and kindness of others. An Omelet Fit for a King has been released to rave reviews and consistently ranks in the top 100 in different Amazon categories. Today it is #67in Books > Christian Books & Bibles > Education > Children & Teens.